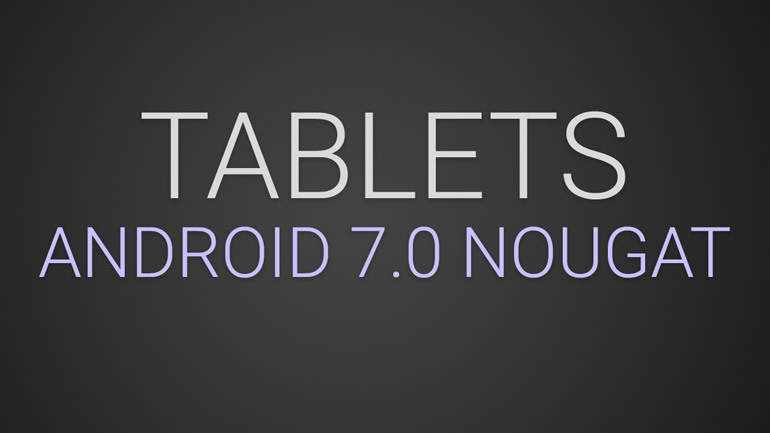 Tablets with Android 7.0 Nougat are quite rare even though we can buy some smartphones with the new mobile operating system from Google already. We probably won’t see any tablets shipping with Nougat directly until the end of spring 2017. But there are some tablets out there that got an update already or will receive a firmware update soon. Let’s take a look at them. As I said, tablets with Nougat are rare but there are some. Mainly the ones from Google though. While the Pixel C is more than a year old already it was the first tablet ever to get a major update to Android 7.0. I’m pretty sure that Google will update this one for at least another year. The HTC made Nexus 9 is supported and updated by Google and while users had to wait a bit the update is available now. If you’re one of the lucky Nexus 9 owners: Go update! Sony has been one of the first Not-Google companys to promise updated to Android 7.0 Nougat and indeed starting in January 2017 they began to roll out an update for the Xperia Z4 Tablet. Due to some issues the updated is on pause right now but should continue very soon. Thanks to some leaks and some announcements by some manufactures we already know of some tablets that should get an update pretty soon. Well, at least some time during the first half of 2017. NVIDIA was the first manufacture to update its tablets to Marshmallow last year and they will continue this tradition this year. The NVIDIA Shield Tablet K1 and the normal but older Shield Tablet will receive Android 7.0 in a couple of week. That’s quite impressive actually since the first Shield Tablet was released with KitKat in 2014 and is still being updated! Huawei is starting a beta roll out of Nougat for 400 MediaPad M3 devices very soon with the final, public update to hit starting in April. By May every MediaPad M3 is promised to run the newest version including the new EMUI 5.0 interface. We’ve seen some models oft he Samsung Galaxy Tab S2 running 7.0 in a couple of leaks already and indeed this tablet will get an update in a couple of month. We’re not sure though if every version of the Tab S2 will be updated… it’s quite likely though. Yes, even the cheaper Samsung Galaxy Tab A 10.1 with S Pen will get a major software update. That’s good to hear, Samsung didn’t mention any exact dates so far though. I’m sure the normal version of the Galaxy Tab A 10.1 without S Pen will get an update too.